Akai could be on to a winner with their cheap and compact sample player. The market for compact digital desks is hotting up. Has Allen & Heath's latest contribution got what it takes to fend off the competition? How much of API's legendary large-console technology and sound have they managed to pack into this smaller sibling? Audient have brought their respected ASP-series preamps to the masses in the form of a new USB audio interface. As well as improving Sonar itself, Cakewalk have brought in some heavy-hitting third-party content. Does X3 have what it takes to tempt buyers away from other recording software? Nearly 20 years after the original, Clavia's Nord Lead has become a studio synth staple. Can its latest incarnation keep the flame alive? Equator prove that real quality needn't cost a fortune, with their new active, coaxial D8s. Focal have made a strong impression in the studio monitor market. Can they do the same in the competitive world of headphones? Wooden PA speakers usually sound better than their plastic equivalents, but they've also been more expensive — until now. HOFA claim that their IQ Reverb combines the realism of convolution with the editability of algorithmic reverbs. With up to 13 different processing tools available, if Nectar 2 can't make your vocal track sound good, nothing can! Can this small ball of foam really take the room out of the equation when recording vocals? Boutique Swedish manufacturers Milab have made possibly the most expensive kick-drum mic ever. But is its quality equal to the price? Novation expand their controller range as they serve up a three-course Launch. We check out what's on the menu. If you fancy a break from traditional musical interfaces, or merely want a fetching accessory for the dashboard of your spaceship, the AlphaSphere could be just the thing. Orchid's low-cost approach to DI and reamp box doesn't cut any corners when it comes to quality. Does Strymon's latest offering finally deliver studio-quality reverb for the guitarist? Read more about Toontrack EZX Metal! First the Rock, then the Boulder, now the Avalanche: Unity's monitor range expands, with the launch of this powerful new sub. Dodge & Fuski's Rob Talbott explains how he creates the band's dubstep drum beats in Cubase. We look at crossfading, Live's secret sound-design weapon. We scrutinise two Rack Extension additive synths and look at how to add harmonic complexity to any source. MOTU's Digital Performer 8 includes some neat new plug-ins — many with applications beyond the obvious. Producer Phil Ramone was legendary for getting great vocal sounds. Here's how he did it — and how you can do the same. Our recording engineer tackles the challenge of recording a singing guitarist, and weighs up the merits of several mic techniques. From de-essing to complex drum processing, side-chain access in Studio One opens up many new possibilities. Learn to set up M/S matrixing in Pro Tools and you open up a world of creative processing possibilities. Work smarter not harder with Smart Controls in Logic Pro X. 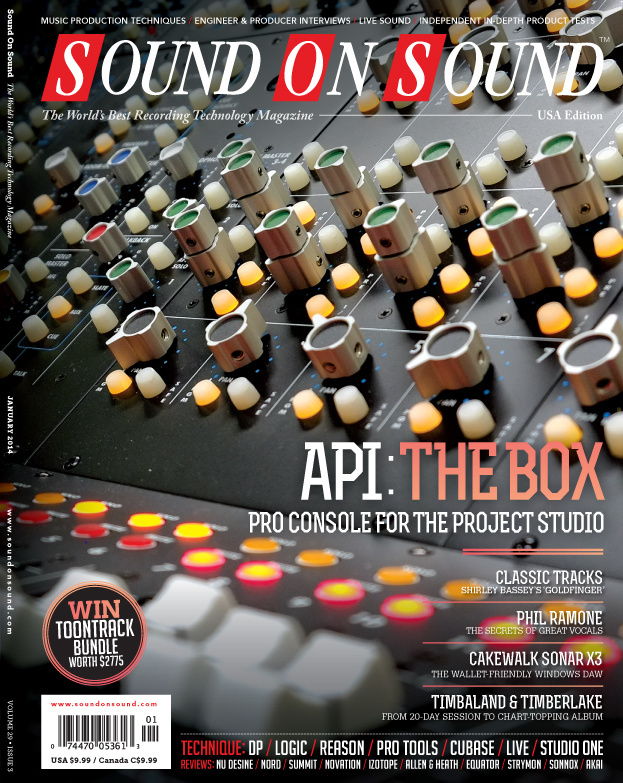 The Mix Review in Sound On Sound This month we analyse hits from Biffy Clyro, Armin Van Buuren and Duke Dumont, and take a look back at a classic mix, Sinead O’Connor’s version of “Nothing Compares 2 U”, from 1990. Two massive hit albums in a year was a pretty good return on 20 days' work for Justin Timberlake, producer Timbaland — and engineer Chris Godbey. Joe Matera, Obsidian Kingdom, The Flickers. Apple have ditched the feline theme and gone Mavericks, but what does that mean for you? They boast faster boot times, total silence and greater durability ­— but is a solid-state drive right for you? Q. Can I plug my keyboards into my audio interface's line-level inputs? Read more about Q. Can I plug my keyboards into my audio interface's line-level inputs? Q. Why are Reflexion Filters used behind the mic if the mic picks up sound from the front? Read more about Q. Why are Reflexion Filters used behind the mic if the mic picks up sound from the front? Q. Why won't my mixes translate better? Tracks that I mix in my home studio tend to sound really bad in my car, but when I correct the mixes so they sound good in the car, they sound awful over my monitors — so what's going wrong? Read more about Q. Why won't my mixes translate better? Vinyl resurgence; surprisingly good classic-rock tribute bands on tour; Live Nation buying and burnishing the old Fillmore live-venue brand; the pining for music's past seems like it's in full swing. Media content for the January 2014 issue.